5 More Than A Pretty Face? From the very first day Android Wear was in the news, the Moto 360 has been "the one to wait for." Every time we posted a story about the G Watch or the Gear Live, the comments were populated with no fewer than a million people declaring their intention to wait for Motorola's round smartwatch. Well, the wait was a bit longer than expected, but the Moto 360 has finally arrived. This $250 smartwatch is the only one you can currently buy with a round screen, but does that mean it's suddenly worth jumping on the Android Wear bandwagon? Let's dig in and find out. Did I mention it's round? Compared to the previous Android Wear watches, the Moto 360 is definitely in a class by itself. I don't just mean that it's round and the others are square—it feels and looks like a premium device. The body of the watch is stainless steel with very clean lines and a beveled edge that leads up to the 1.56-inch Gorilla Glass screen. 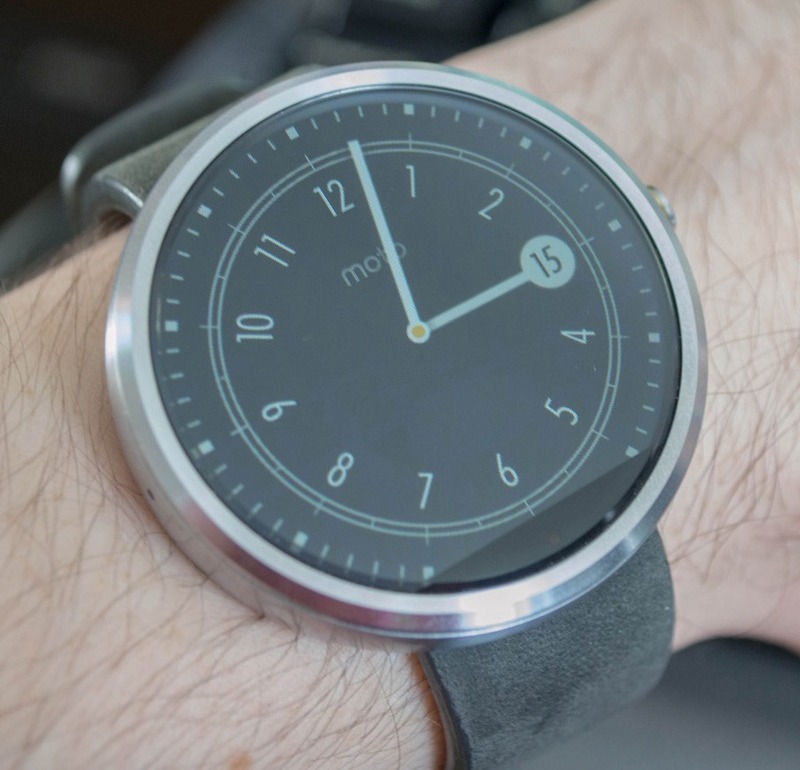 The screen is, of course, the defining feature of the Moto 360. The glass on top has a beveled edge of its own that places the surface slightly above the body of the watch, giving it a very cool look when the screen is asleep. When it's on, there's a subtle refraction of the light at the edge as content scrolls off the edge. I can see some people finding this a little annoying, but I actually rather like the effect. The display driver cutout at the bottom isn't ideal, but it bothers me far less than I thought it would, especially when using black watch faces. On the left side of the casing is a crown button, but it's just a button (it doesn't spin). The button is all metal as well with a series of concentric circles etched into the pressing surface to make it a little grippy. The attention to detail here is amazing. Pressing the button can wake or sleep the watch, and a long-press will open the settings menu. I wish there were some more options here—perhaps a customizable shortcut. However, i suspect that's a limitation in Android Wear right now. The back of the watch is plastic, but it feels solid. In the center is the optical heart rate sensor, which works okay. It flips on throughout the day to track your heart rate and let you know when you've had the daily recommended 30 minutes of activity. If you leave the Moto 360 sitting on a table face down, you can see the green light in the sensor switch on every now and then. The built-in app can also be opened manually. I don't particularly need this feature (and I'm sure others agree with me), so perhaps a toggle in a future OTA update would be nice. The Moto 360 will be offered with a variety of metal and leather band options later, but right now you can only get it with a black or grey leather band. I didn't expect to like the stock band on the 360—I'm not usually a fan of leather. I'm more of a nylon NATO band guy. However, this is a very comfortable leather band. The bands are made by Chicago's Horween Leather Company, and they're incredibly soft and flexible. I can't speak to long-term durability just yet, but I do worry that it might scuff a little too easily. I already have a light depression where the buckle sits. Not only is the band comfortable on the wrist, the watch itself feels great. It's much lighter than you'd think from looking at it, and the the shape fits much better on my boney little wrists. A round watch body simply fits better for me—I know that's not a universal truth, but thin-wristed people take note. 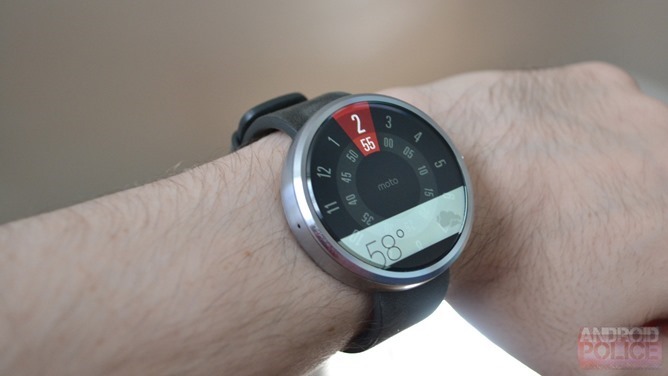 The overall design of the Moto 360 is fabulous. I love the futuristic style of this device. It's just different enough that it looks special without seeming obviously like a gadget at first glance. The Moto 360 is big, but not too big if you've got average or small wrists. Women with smaller wrists will definitely find it's a bit on the large side, though. I'm sure I don't need to spell out every facet of the 360's spec sheet for you at this point, but there are a few things to discuss. At the heart of this device is a TI OMAP 3 processor based on a single ARM Cortex-A8 core (probably the OMAP3630). It has probably been a long time since you've seen that chip come up—TI doesn't even make consumer OMAP chips anymore after bailing on the OMAP 5 rollout. The OMAP 3 was big news back in 2011 when it powered devices like the Motorola Droid X, Droid 2, Palm Pre 2, and Motorola MOTOACTV smartwatch. Yes, the Moto 360 is running the same processor Motorola used in its smartwatch from three years ago (other Wear devices have a Snapdragon 400). My pet theory is that Motorola wanted to control costs with this device from the very beginning, knowing it would be hard to predict where the expected price of Wear devices would fall by the time the 360 was ready for release. So engineers turned to the stockpile of OMAP 3 chips that were originally destined for MOTOACTVs that were never built. Again, I don't know this for sure—it's just a guess. I'm going to get into battery life in detail shortly, but the OMAP has been pointed to by some as the cause of the 360's battery life issues. I'm sure that's part of it, but Motorola has a lot of experience working with OMAP. There's probably a lot of software optimization under the hood, and more still to come. The OMAP 3 is paired with 512MB of RAM and 4GB of local storage. The 320mAh (typical capacity) battery is also smaller than other Android Wear devices. The addition of standard Qi charging is much appreciated, though. The round LCD has a resolution of 320x290, which works out to 205PPI. At normal watch viewing distance, the screen looks sufficiently crisp. The colors are very nice and this screen is bright. Looking at the Moto 360 next to the G Watch shows just now much nicer Motorola's screen is, and I don't just mean because it's round. The G Watch struggles in bright outdoor light, but the Moto 360 is perfectly readable. The addition of the ambient light sensor also means you don't have to fiddle around with settings each time you venture outside. This is also a gapless display, so even off-axis it looks great. This is the big question everyone has about the Moto 360. The first few reviews that appeared shortly after the official unveiling claimed you would have to recharge the 360 at least once or twice during the day. If that were the case, it would be a pretty terrible product. More recent assessments have offered some hope. I've been tracking my battery life carefully, and I'd agree more with the hopeful assessments. It's not all sunshine and rainbows, though. 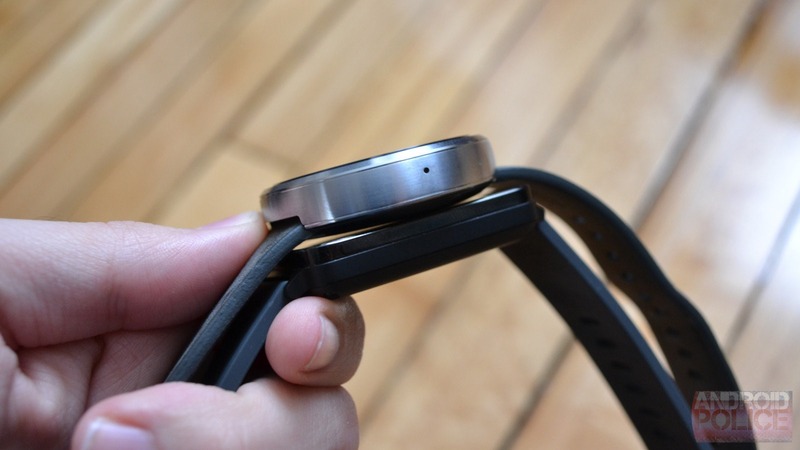 The Moto 360's default usage mode is "ambient off." Ambient mode is what other Android Wear devices do—when not active, the screen goes to a black and white theme and lowers the brightness. Lift the watch up, and the UI flips back to color and brightens to the set level. With ambient mode off, the Moto 360's screen turns completely off and only wakes up when you lift your wrist to look at it. Other Wear devices remain in ambient mode all the time, so just on the basis of this we can say unequivocally that Motorola's watch has poorer battery life than other Android smartwatches. All the numbers that follow are based on several days of averaged measurements, but to give you a better idea of what kind of performance you can expect, I'll briefly go into how I use the device. I leave the auto-brightness mode on all the time as it seems to work well. I tend to get a fair number of Hangout messages per day, several of which I'll respond to via voice. Emails, I get a lot of those. I also also use voice search on the watch several times throughout the day. I'd call this moderate use. With the default settings (ambient mode off), my 360 is able to make it between 18 and 20 hours on a charge. The average drain per hour is under 5%. This is totally workable in my opinion. It might be nice to have a little more leeway for times when usage is heavier, but 1.5 days of use isn't much good as it would still have to be charged every night. For an apples-to-apples comparison with other Wear devices, the closest you can get is turning on ambient mode. With this setting activated, battery life on my watch drops to 12-13 hours. Battery drain works out to a bit more than 7% per hour. Maybe that's fine for getting you through the day, but you're going to have to recharge before bedtime and there's very little margin for error. This is rather disappointing for me as I much prefer ambient mode. There are a lot of times I'd like to glance at my wrist to see the time or a notification without doing the full twist gesture. This is the experience I've had with the Moto 360. Others are having issues with the battery lasting through the day even without ambient mode on (coughARTEMcough). I'm not sure if there is some usage pattern that can cause this or if there are some bad units out there. There may also be some issues related to that messy out of the box upgrade, which I will go into shortly. The bottom line on battery life is this: it's fine, as long as you're willing to make a few sacrifices. For a more pessimistic analysis of battery life on the Moto 360, I imagine Artem is in the comments down below. 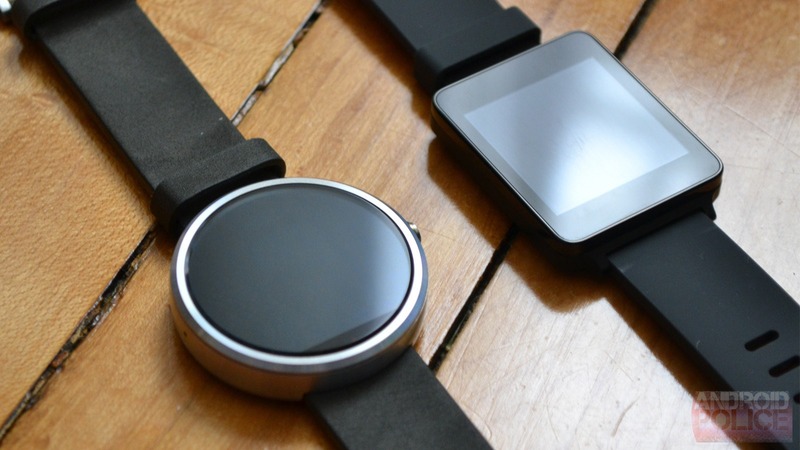 The Moto 360, despite being a lovely device, makes a bad first impression. I think this device was the worst out of the box experience I've ever had. The firmware Motorola ships on the 360 is beyond buggy—it's non-functional. If you do what most people would do (pair the phone) before you've charged the battery past 80%, it's going to be a mess. The battery drain is so severe it won't even charge unless you reset it and charge before pairing. Once the battery is charged past 80%, you can pair and download the 4.4W.1 update. Whenever you do get the watch updated, the pairing process works properly and you can charge it. Really, Motorola delivered a product that won't even charge properly until it gets a software update. But I digress—this is only the first few frustrating hours with the 360. This is Android Wear—you know what that means and what it does. You get notifications and Google Now cards on the watch, and apps can sync over mini-APKs to the watch. OEMs aren't allowed to change the fundamental software, so I won't go into excruciating detail about how Wear works. However, there are a few notable things to discuss with regard to the 360's software. Firstly, the watch faces are gorgeous. 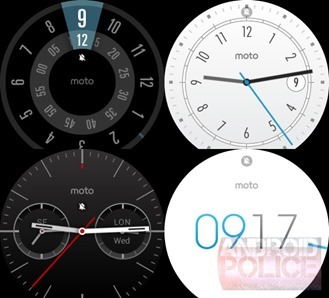 Motorola did a fabulous job designing not just classic analog faces, but other looks that also take advantage of the round display. There's a digital readout that has a second hand ticking around the perimeter of the screen, a radial face with spinning dials that align at the top to display the time, and a modified analog face with the numbers spread out in an arch at the top. 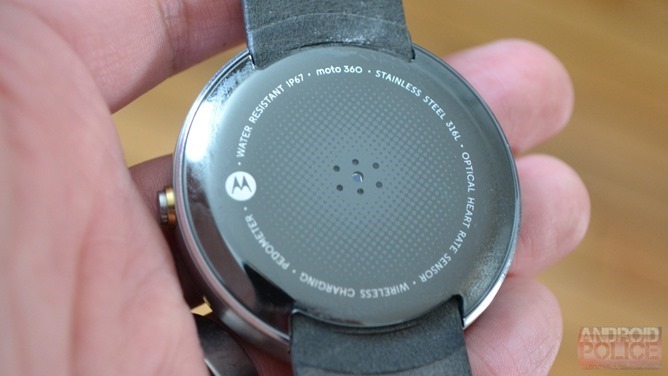 Motorola has also gone above and beyond other OEMs by making its Motorola Connect app into a companion for the watch. You can use this app to customize the watch faces with different colors and UI elements. There aren't a ton of options, but even being able to tweak the accent color of a watch face is much appreciated. The Moto 360 is, of course, round. Having only experienced Wear on a square device thus far, it was a little off putting to use it on a round screen at first. 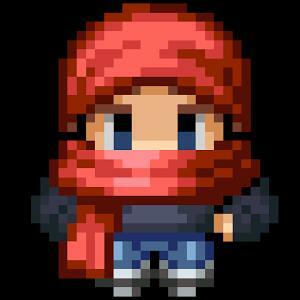 Maybe you've noticed that all the screenshots in this review are square. That's because Android Wear is still rendered in a square format (there's really no other way to do it). The corners are just clipped off by the watch. That means some UI elements will fall off the edge of the screen at the top or bottom, and there are very few tweaks to the software to accommodate the round screen. You might have to drag things a little closer to center to see them, but that doesn't bother me too much. It's a tradeoff I'm willing to make. Ambient mode is a little different on the Moto 360 as well. Other Wear devices go to a plain black and white screen when they are in sleep mode, but the Moto 360 has a much more attractive grayscale look. Additionally, the watch still shuts off the screen completely when your arm is at your side or upside down. Basically, if you can't see your wrist, the screen is off. Move your arm just a little bit, and the ambient screen comes back. The full color active screen still comes on normally when you raise your wrist, though. Whether or not you're using ambient mode, the 360 seems very good about turning on when it's supposed to. As for performance, the Moto 360 is reasonably snappy. All the other Android Wear devices are rocking the much more modern Snapdragon 400 SoC, but the Moto 360's OMAP 3 is demonstrably slower. The performance difference isn't huge, but it's there. There isn't any lag, but the animations are ever so slightly less smooth on the 360. I feel like you won't even be able to tell unless you have another Wear device on hand with which to compare. If you have ambient mode on, the switch from grayscale to color can also be a little jittery. One other thing that does stand out about the 360's software is the connectivity. I've had more issues with the 360 maintaining a Bluetooth connection than I ever had with the G Watch. I'd say it loses contact with the phone 4-5 times per day for a few seconds. This happens with multiple phones, so I'm pretty certain it's the watch. I assume this will be ironed out with a future OTA update. More Than A Pretty Face? After six months of build-up, there was no way the Moto 360 could live up to all the hype. I doubt there is any product in existence or on the drawing board that could have met the lofty expectations set for the 360. It definitely has its problems—battery life being the main one. Overall performance could be a little better as well. It's a good smartwatch, but that's mostly thanks to the (in my opinion) excellent industrial design. 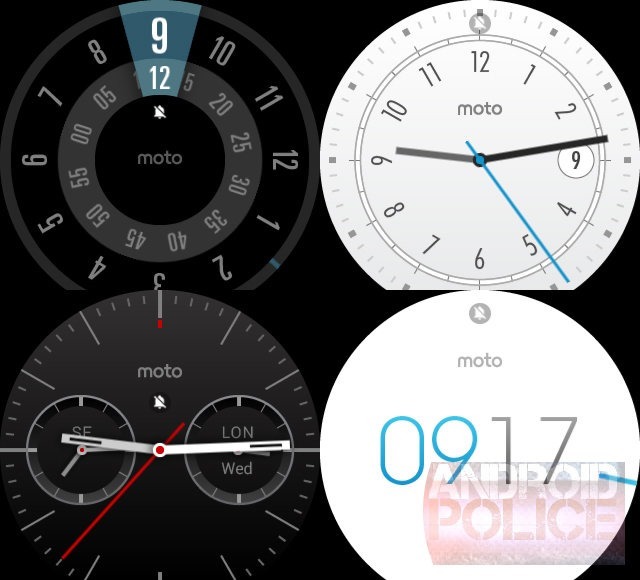 The watch faces Motorola cooked up are awesome, but most of the remaining software experience is the same on other devices. And Qi charging—thank you Motorola. This is a good smartwatch, but it's not great. Frankly, the battery life remains a sticking point. Other watches can make it all day and then some with ambient mode, but not the 360. To be assured of a worry-free day of use, you need to leave ambient mode off. Maybe Motorola will be able to improve the battery life with an update, and also address the minor performance hiccups. 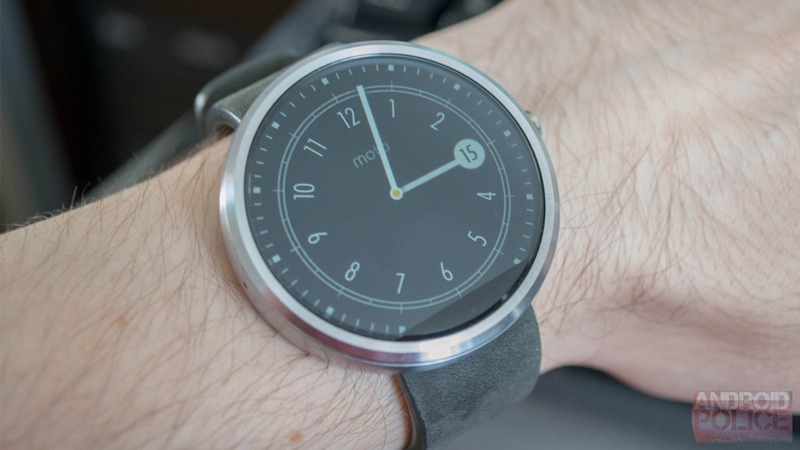 If that happens, the Moto 360 could become a truly killer watch. The Moto 360 might still be the best Android Wear device out there simply because it looks good. I don't know if that's enough reason to buy it, though. It is, however, my current smartwatch of choice.